With its new F-35, Meng offers a new highlight on the modeling market. Just by the first glance into the box one can tell that there’s a lot of bang for the bucks. Let’s check out if Meng’s still able to do fine aircraft kits after lurking around in the armour department for so long now. The Lockheed Martin F-35 Lightning II is a family of single-seat, single-engine, all-weather stealth multirole fighters. The fifth-generation combat aircraft is designed to perform ground attack and air superiority missions. It has three main models: the F-35A conventional takeoff and landing (CTOL) variant, the F-35B short take-off and vertical-landing (STOVL) variant, and the F-35C carrier-based Catapult Assisted Take-Off But Arrested Recovery (CATOBAR) variant. (…) The program is the most expensive military weapons system in history. Meng delivers a well stuffed box. It includes around 220 parts on 14 sprues, upper and lower fuselage shells, a tiny PE-card, decals (printed by Cartograph) for two machines and the instructions of course. When it comes to Meng we expect high quality cast parts with sharp contours and fine recessed details. And we don’t get disappointed by looking at the parts. The panel lines are sharp and delicate, the positions of the ejector pin marks are well-thought-out and shouldn’t be visible after assembly. The most eye-catching feature of the kit are the Radar Absorbing Material-surfaces (RAM), those raised zig-zag-patterns are sadly way to prominent. They protrude 0.15 mm from the rest of the surface; doesn’t sound that much, but in 1/48 that’d be 7.2 mm on the real thing. That would cause some serious aerodynamic issues for sure. This unfortunate ‚feature‘ can also be found on the competing kits from Kitty Hawk (1/48) and Italeri (1/32). Hard to tell why Meng had to copy it. The fuselage consists of an upper and a lower shell. The lower shell holds all the openings for the weapons bays, landing gear bays and engine intakes. The engine nozzle is nicely detailed and shows all the features you can expect from modern ejection molding, plus a little help from the PE-card. More can only be done with resin, but I’m sure we don’t have to wait for too long until the usual suspects come around. The cockpit of the F-35 is a hi-tech design and consequently plain looking, so you can’t expect too much from the model’s CP-design either. The instrument panel is nothing more than a wide-screen monitor that’s to be covered with a decal. The side consoles contain the thrust regulator and control stick. The ejection seat looks solid for a styrene one and can be further detailed with the PE-belts. The one-piece canopy is made of thin and crystal clear material. Neither flow-marks nor scratches are detectable. To complete this part the inner framework has to be glued in. The builder can choose between open or closed position. The landing gear looks as plain as the CP. That can’t be traced back to the lazyness of Meng’s kit designers but to the simplicity of the F-35’s components. The tires come with a weighted appearance, that’s a plus. Unfortunately the details on cap and rim look a bit shallow. On this point we have to wait for rescue from our Czech friends. When it comes to armamet Meng acts pretty reserved. 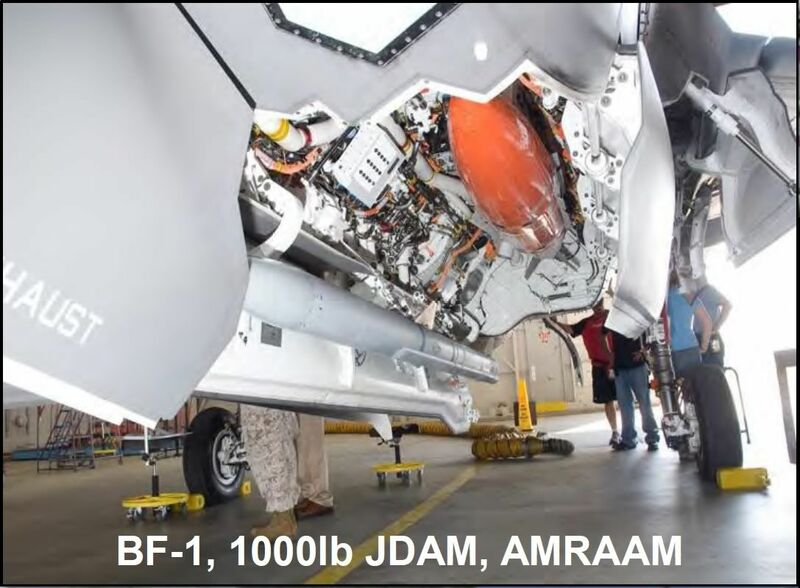 Only GBU-53 bombs and AIM-120C rockets are included to equip the internal bays. Though there are wing pylons included, you can’t find anything in the box to arm them. Looks like Meng wants to sell us one of their separate armament sets (SPS-043, SPS-044 and SPS-045). That may be annoying for some of us, but on the other hand they’re selling this kit for a reasonable price and for that sacrifices are to be made. Also the most F-35A we’ve seen on photographs so far lack the external stores. The instructions are structured in 29 steps, all text is bilingual in Chinese/English. Clarity is adequate, so is the print quality. We surely can work with them as they are, but they’re clearly inferior to those who come with the Eduard or AMK kits. A separate sheet shows the two offered schemes. Nothing too fancy there, since both are covered in Stealth Camouflage Grey. Color callouts relate to the products from Meng (AK Interactive) und the Mr.Hobby/Gunze (Water Based Acrysion line). Meng put a great kit of the F-35A into the box. Shape and outlines matches the original quite well, which was a problem of the first kits (Panda), who came out before good reference material was available. It’s all there you need to build a great ooking model of this stupid expensive fighter, maybe some resin tires could be added. We got our kit for unbeatable € 30 ($ 36), but any offer below $ 50 is a bargain for such a well designed kit. The only real issue are those too prominent RAM-surfaces. This can be overcome by using one of the already available mask sets (Galaxy Model D48003 or DNModels 48/827-035). After you put them on, shoot the surface with filler (Mr.Sufacer 1000 for example) in some thin layers and you should be fine. Hopefully Meng will come back soon with another winged kit. They’re pretty good at making them! Both the Galaxy and DNModels masks cover the Have Glass Grey and you paint the RAM areas so if the height of the Ram areas is a problem they will have to be sanded . Mission Models has a nice Have Glass grey which seems to have metallic particles in it. I’m brush painting my F 35 and it leaves no brush marks. One thing I found out-besure the intake ducting is perfectly fitted into the bottom shell. It it’s not perfect you can have problems glueing the front part of the lower shell to the intake ducts without having some gaps. Thanks for your input, Bill. Much appreciated. If you have further remarks according the buildability of the kit please let us know. 1. Integrated fuselage/body is a must. Having a separate wingroot seam is asking for trouble, especially if you have raised RAM tape in close proximity. Unfortunately, every F-35 kit I have seen (Kitty Hawk, Italeri) has this issue and the resulting wingroot gaps need so much squaring up to get the joint to vanish that it is possible to introduce some major ‚leveling‘ issues on the zero anhedral wing. Add to this the weight of underwing stores and, to be an improvement in model design, the F-35 really needs to be ONE PIECE upper and lower sides, like the Hasegawa and Academy Raptors. I would make a similar case for things like the split verticals with seams running through the RAM tape. Derp. The company that doesn’t try to make things cheap enough to do a multivariant set of tools (F-35A/B) will clean up here because too much of the Kittyhawk/Meng kits are basically cloned. See? _At Most_ we are talking about the equivalent of armor model anti-skid texture in terms of how far raised from the surface of the plastic it is. Myself, the only company which has got it right so far has been Hasegawa and that’s because they understood that what you need is an OUTLINE for the placement of masks or decals so that you can rub down the plastic to get it prepped for painting without losing raised details. Indeed, the ideal RAM tape is a primer coat of Aggressor Grey, over which you place THIN tape (more per sheet) within outline of the RAM zigzags as easy to apply segments before applying the main surface color. Doing it as a negative mask with the RAM tape between large panels of masking is a waste. 3. The Main Surface Color. Is two part. The undercoat is a metallic color like a dull bronze or German silver effect with an overcoat which is the actual SWAM coating of Dark Gull Grey or similar in a clear ‚Top Coat‘, like a protective wax. This is because different materials in the airframe skins create different impedance (resistance) loading values at their joins as the radar turns from a wave to a current state and can re-radiate at these material breaks. By unifying the entire airframe, under one metallic undercoat and then tonally adjusting that with a clear dope that also has surface wave absorbers, you get a filtered multi-color/prismatic effect. Just like it’s bigger brother, from certain angles, the F-35 shines like a mirror. The effect is just toned down with what amounts to tinting effect. You need to specifically show how this is done, with a tried and true paint application system in the instructions, because 90% of the appearance of Stealth Aircraft, with all their weapons internal and very dull markings, is going to be about getting a decent surface finish. 4. Attention To Detail Is Crucial. The Meng kit is superior to the Kittyhawk in the sense that it is an easer build. Parts fit is better and it has fewer head scratcher sub assemblies (separate radome tip etc.). But in terms of detail, it is actually a step back. Will tell you that the Meng equivalent is junk. It’s not worse than the Kittyhawk. But it’s not an improvement either. And as the 1:1 pictures show, you CAN SEE these details, even with ordnance in the bays. There is wiring and black boxes all over the place because that was an easy way to avoid having huge skin access panels for systems LRUs that need frequent replacement and maintenance. The Meng PE is irritating. Yes, the harness is nice but why not go with something like the Yahu PE, multilayer, instrument panels instead? It is so much easier to cut and paste a self adhesive PE to side consoles and main instrument panel because it means a two-step process (paint tub, apply painted PE) and you can begin primary assembly. Early previews of the Meng F-35A kit stated that it would have a bunch of weapons it clearly does not. Namely the full gamut of GBU-31/32/39/53 (now available in the Meng ‚GPS Bombs‘ aftermarket kit) and the AIM-9X. Okay, everyone has a profit motive. Let’s look at Meng’s. IMO, the Meng kit, largely because of the break down of the parts and the mistake with the RAM outlines, is not really that much etter than the Kittyhawk F-35A. If you don’t have an F-35A and want one, by all means get the Meng. But if you already have the Kittyhawk kit and you want the Small Diameter Bombs (the Kittyhawk already has the other munitions now in use), you can spend $16.99 for the weapons set for your KH kit. Or you can spend 44 dollars for the Meng F-35A. Conversely, the F-35A is _going to get_ a bunch of weapons which are not presently available on any jet but which will be essential to fight on tomorrows more intense battlefields. Meteor, AARGM-ER, JAGM, CUDA, JSM and JASSM-ER. None of which are readily available in existing aftermarket sets. This is not a maybe so, maybe no, condition. The F-35 EOTS and DAS can target out to about 40nm. The APG-81 to well over 60nm. It makes no sense for an 80 million dollar airframe to close to 10-12nm to deliver a GBU-12 or JDAM. Such is suicidal, in much the same way as the F-117 shoot down over Serbia was ‚predictably engaged‘ due to the ground track passing so close to a common set of target points. Whichever way it went, the Nighthawk was going to pass close enough to an EOCG capable SAM threat to OPTICALLY tracked and killed. As the SA-3 did. Put weapons in the box which are unique to that F-35 kit and /applicable/ to other kits of modern aircraft and you will find people buying your model, just to have up to date ordnance. THAT is a sound, profit motive driven, business model.